Eating Disorders Boot Camp Home-Study Course! 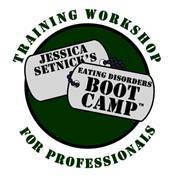 Order Eating Disorders Boot Camp today to receive the world's best-selling eating disorder treatment training course! Welcome to Eating Disorders Boot Camp! It's time for you to experience the one and only, the most Comprehensive Eating Disorder Training Course that has been loved by hundreds of dietitians and others around the world... Now Updated to include the changes to the new Eating Disorders Diagnostic Criteria. This package includes everything that Eating Disorders Boot Camp has to offer, PLUS extra features added for the first time. 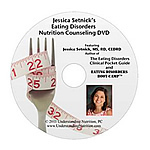 � A CD-ROM containing over 70 pages of Eating Disorders Boot Camp Materials, including the slides from the original Boot Camp, the articles Jessica constantly refers to, patient educational handouts and more! � The Highlight that sets Eating Disorders Boot Camp apart from any other Home-Study Course in the world... 30 minutes on the phone with Jessica... to ask questions and receive personal advice! And P.S. this serves as the interactive portion required for Continuing Education Credit... that means NO EXAM! � A Certificate of Completion providing 10 hours of Continuing Education Credit for dietitians and dietetic technicians and which ALSO initiates you into a Select Group eligible to sign up for future Supervision and Professional Coaching with Jessica (Jessica ONLY coaches Graduates of Eating Disorders Boot Camp)! 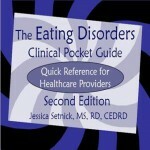 The Eating Disorders Clinical Pocket Guide is a goldmine of tables, advice, and guidelines for doctors, nurses, dietitians and counselors in every area of practice. NOW UPDATED to include the new DSM-5 Eating Disorder Diagnostic Criteria.